All American Industries, LLC is at the forefront of the fencing, deck building, and landscaping industries. We pride ourselves on professionalism and cutting-edge service. We enjoy our work, and we are constantly striving for excellence. We service the Florida Gulf Coast Panhandle and Alabama Gulf Coast including Cantonment, Beulah, Pensacola, Gulf Breeze, Navarre, Fort Walton, Destin, Gulf Shores, Spanish Fort, Perdido, and Daphne. We care about your investment with us, and we will take every step necessary to ensure that your experience with us is the best. We want your referral more than your money! In the Gulf Coast area, we value our time spent outside where we can enjoy the beautiful weather. If you want to enjoy this beautiful weather right from your backyard and enjoy it in style, get a deck for your home. For a high-quality deck that will look beautiful and new for years to come, give us a call. With our many years of experience and our dedication to quality work, we can provide a beautiful, solid custom deck for your home. 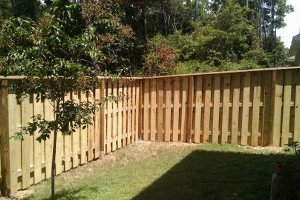 We offer quality fencing work as well. We are experts with some major fencing materials: wood, aluminum, and vinyl. We strive to provide high-quality work so that, no matter what kind of fence you want for your home, we can provide a beautiful, durable one tailor-made just for you. If you want a sturdy, excellent deck or fence, call us today. We are among the area's premier fencing and deck experts, so with us, you can bet on one thing: top-quality work that you will enjoy for years to come.